Content in art takes the form of portraits, landscapes, still-lifes, genre art, and narrative art. Describe different categories of figurative or abstract art. Content in a work of art refers to what is being depicted and might be helpful in deriving a basic meaning. It appears in the visual arts in several forms , all of which may be figurative (realistic) or abstract (distorted). Among them are portraits, landscapes, still-lifes, genre art, and narrative art. Portraits represents the likeness of a person and can include a study of the sitter’s mood or personality. Landscapes depict natural scenery such as mountains, valleys, trees, rivers, and forests, especially where the main subject is a wide view. A still-life is a work of art depicting mostly inanimate subject matter, typically commonplace objects that may be either natural or man-made. Genre art involves the pictorial representation in any of various media of scenes or events from everyday life, whereas narrative art tells a story that may be real or imagined. Content in a work of art refers to what is being depicted and might be helpful in deriving a basic meaning. Sometimes content is straightforward; in other cases, however, it is less obvious and requires additional information. Content appears in the visual arts in several forms, all of which may be figurative (realistic) or abstract (distorted). Among them are portraits, landscapes, still-lifes, genre art, and narrative art. A portrait is a painting, photograph, sculpture, or other artistic representation of a person, in which the face and its expression are predominant. The intent is to display the likeness, personality, and even the mood of the person. For this reason, in photography a portrait is generally not a snapshot, but a composed image of a person in a still position. A portrait often shows a person looking directly at the painter or photographer in order to most successfully engage the subject with the viewer . Philip Burne–Jones Holding a Cat : George Grantham Bain Collection, Library of Congress, Washington, DC. Landscape painting, also known as landscape art, is the depiction in art of landscapes—natural scenery such as mountains, valleys, trees, rivers, and forests, especially where the main subject is a wide view—with its elements arranged into a coherent composition . In other works, landscape backgrounds for figures can still form an important part of the work. Sky is almost always included in the view, and weather is often an element of the composition. 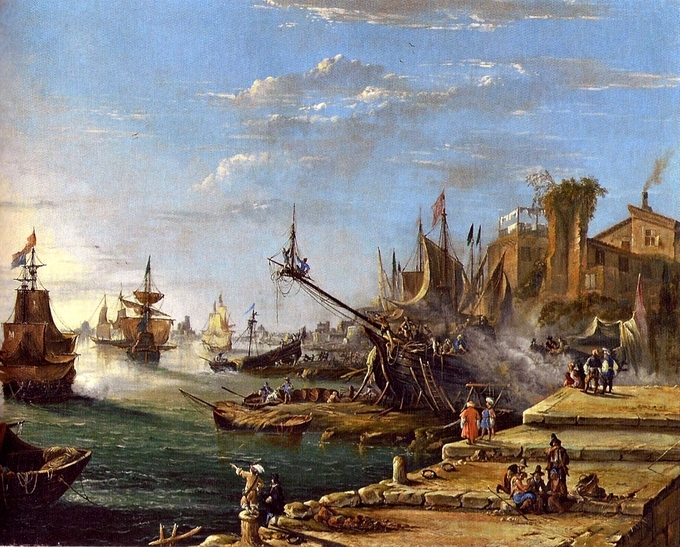 Detailed landscapes as a distinct subject are not found in all artistic traditions and develop when there is already a sophisticated tradition of representing other subjects. Henri Matisse. Landscape at Collioure (1905): Oil on canvas. 38.8 x 46.6cm. Museum of Modern Art, New York. Matisse was a member of the Fauves (French for “wild beasts”), who used bold colors to convey emotions. A still life (plural still lifes) is a work of art depicting mostly inanimate subject matter, typically commonplace objects that may be either natural (food, flowers, dead animals, plants, rocks, or shells) or man-made (drinking glasses, books, vases, jewelry, coins, pipes, and so on). Early still-life paintings, particularly before 1700, often contained religious and allegorical symbolism relating to the objects depicted. Some modern still lifes break the two-dimensional barrier and employ three-dimensional mixed media, and use found objects, photography, computer graphics, as well as video and sound. Maria van Oosterwijk. Vanitas Still-Life (1668): Oil on canvas. 73 x 88.5cm. Kunsthistorisches Musuem, Vienna. Genre art is the pictorial representation in any of various media of scenes or events from everyday life, such as markets, domestic settings, interiors, parties, inn scenes, and street scenes. Such representations (also called genre works, genre scenes , or genre views) may be realistic, imagined, or romanticized by the artist. Nicolaes Maes. The Idle Servant (1655): Oil on canvas. National Gallery, London. Dutch Baroque genre scenes often have important moral lessons as their subtexts. Narrative art is art that tells a story, either as a moment in an ongoing story or as a sequence of events unfolding over time. Some of the earliest evidence of human art suggests that people told stories with pictures. However, without some knowledge of the story being told, it is very hard to read ancient pictures because they are not organized in a systematic way like words on a page, but rather can unfold in many different directions at once. Hagesandros, Athenedoros, and Polydoros. Laocoön and His Sons (First century BCE): Marble. Vatican Museum, Rome. This marble sculpture depicts a scene from Virgil’s epic The Aeneid, in which the Trojan seer Laocoön foresees the Trojan Horse and the destruction of Troy by the Greeks. Before he can warn his fellow townspeople, the sea god Neptune (an ally of the Greeks) sends his serpents to kill Laocoön and his sons. Art exists along a continuum from realistic representational work to fully non-representational work. Representational art, or figurative art, references objects or events in the real world. Romanticism , Impressionism , and Expressionism contributed to the emergence of abstract art in the nineteenth century. Even representational work is abstracted to some degree; entirely realistic art is elusive. verisimilitude:The property of seeming true, of resembling reality; resemblance to reality, realism. Painting and sculpture can be divided into the categories of figurative (or representational) and abstract (or non-representational). Figurative art describes artwork – particularly paintings and sculptures – which are clearly derived from real object sources, and therefore are, by definition, representational. Since the arrival of abstract art in the early twentieth century, the term “figurative” has been used to refer to any form of modern art that retains strong references to the real world. Johann Anton Eismann, Ein Meerhafen, 1600s: This figurative work from the 17th century depicts easily recognizable objects—ships, people, and buildings. Artistic independence was advanced during the nineteenth century, resulting in the emergence of abstract art. Three movements which contributed heavily to the development of these styles were Romanticism, Impressionism, and Expressionism. Abstraction indicates a departure from reality in its depiction of imagery . Abstraction exists along a continuum; it can formally refer to compositions that are derived (or abstracted) from figurative or other natural sources, or it can refer to non-representational art and non-objective art that has no derivation from figures or objects. Even art that aims for verisimilitude of the highest degree can be said to be abstract, at least theoretically, since perfect representation is likely to be exceedingly elusive. Artwork which takes liberties, altering, for instance, color and form in ways that are conspicuous, can be said to be partially abstract. 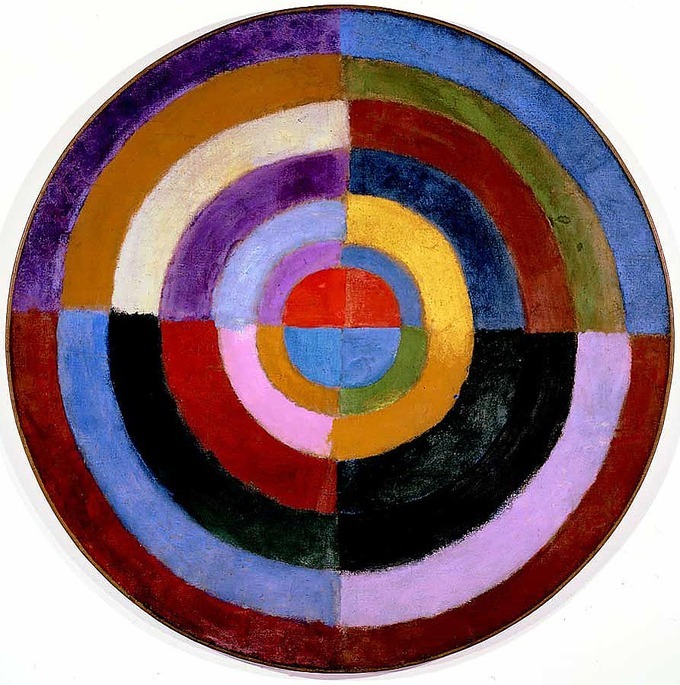 Robert Delaunay, Le Premier Disque, 1912–1913: Delaunay’s work is an example of early abstract art. Non-representational art refers to total abstraction, bearing no trace of any reference to anything recognizable. In geometric abstraction, for instance, one is unlikely to find references to naturalistic entities. Figurative art and total abstraction are nearly mutually exclusive, but figurative or representational art often contains at least one element of abstraction. Meaning in nonrepresentational art is highly subjective and can be difficult to define. Nonrepresentational artwork refers to art that does not attempt to represent or reference reality. In the late 19th century, artists began to move toward increasing abstraction as a means of communicating subjective experience more personally and creatively. Artists such as Kandinsky and Mondrian viewed art as an expression of spirituality. expressionism:A movement in the arts in which the artist does not depict objective reality, but rather the subjective expression of inner experience. nonrepresentational:Not intended to represent a physical object in reality. Nonrepresentational art refers to compositions which do not rely on representation or mimesis to any extent. Abstract art , nonfigurative art, nonobjective art, and nonrepresentational art are related terms that indicate a departure from reality in the depiction of imagery in art. Meaning in nonrepresentational art is highly subjective and can be difficult to define. We can focus on the elements of the artwork (form, shape, line , color, space , and texture) in terms of the aesthetic value of the work, but the meaning will always be personal to the viewer unless the artist has made a statement about his or her intentions. Generally, we can look at nonrepresentational art as the personal expression of an artist’s subjective experience. Certain movements have described their intentions as an aim to evoke moods or emotions in the viewer. A good example are the expressionists of the early 20th century, who aimed to present the world solely from a subjective perspective , distorting it radically for emotional effect. Nonrepresentational art has often been explored by artists as a means to spiritual expression. 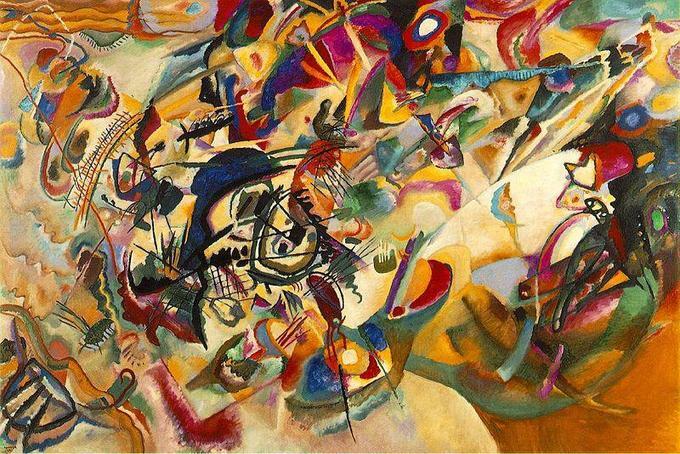 Wassily Kandinsky, a Russian painter, printmaker, and art theorist, is one of the most famous 20th century artists and is generally considered the first important painter of modern abstract art. As an early modernist in search of new modes of visual expression and spiritual expression, he theorized (as did contemporary occultists and theosophists) that pure visual abstraction had corollary vibrations with sound and music. He posited that pure abstraction could express pure spirituality. Wassily Kandinsky, Composition VII, 1913: Kandinsky is recognized as the father of modern abstract art in the 20th century. Piet Mondrian’s art was also related to his spiritual and philosophical studies. In 1908 he became interested in the theosophical movement launched by Helena Petrovna Blavatsky, who believed that it was possible to attain a knowledge of nature more profound than that provided by empirical means, and much of Mondrian’s work for the rest of his life was inspired by his search for that spiritual knowledge. Iconography is the scholarly study of the content of images, including identification, description, and interpretation. Academic studies of iconography in painting emerged in the 19th century in France and Germany. Iconographical scholarship became particularly prominent in art history after 1940. In the 20th century, studies of iconography have become of interest to a broad public beyond the scholarly community. iconography:The branch of art history which studies the identification, description, and interpretation of the content of images. Iconography is the branch of art history which studies the identification, description, and interpretation of the content of images such as the subjects that are depicted, particulars of composition , and other elements that are distinct from artistic style . Iconography as an academic art historical discipline developed in the nineteenth century in the works of scholars such as Adolphe Napoleon Didron (1806–1867), Anton Heinrich Springer (1825–1891), and Émile Mâle (1862–1954). Christian religious art was the main focus of study throughout this period, and French scholars were especially prominent. They looked back to earlier attempts to classify and organize subjects encyclopedically, as guides to understanding works of art, both religious and profane, in a more scientific manner than the popular aesthetic approach of the time. These early contributions paved the way for encyclopedias, manuals, and other publications useful in identifying the content of art. In early twentieth-century Germany, Aby Warburg (1866–1929) and his followers Fritz Saxl (1890–1948) and Erwin Panofsky (1892–1968) elaborated the practice of identification and classification of motifs in images to using iconography as a means of understanding meaning. Panofsky codified an influential approach to iconography in his 1939 Studies in Iconology, where he defined it as “the branch of the history of art which concerns itself with the subject matter or meaning of works of art, as opposed to form”. The distinction he and other scholars drew between particular definitions of “iconography” (put simply, the identification of visual content) and “iconology” (the analysis of the meaning of that content) has not been generally accepted, though it is still used by some writers. 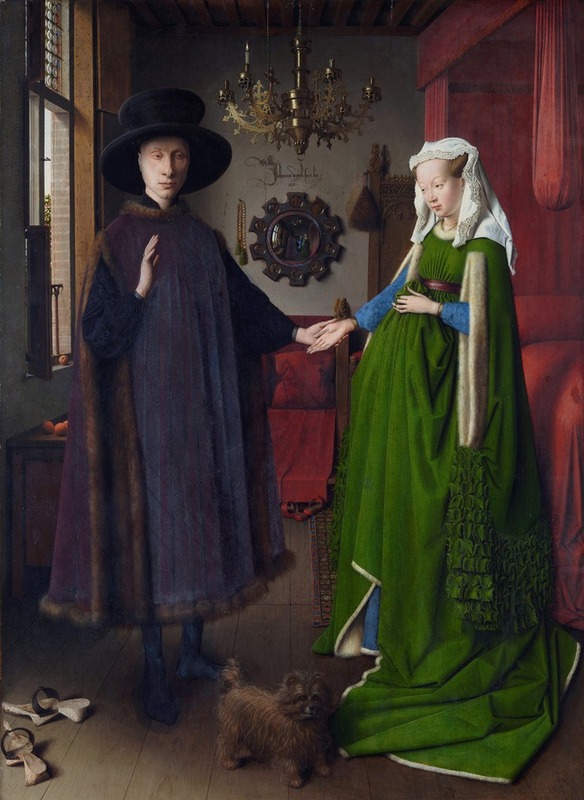 While most iconographical scholarship remains highly dense and specialized, some analyses began to attract a much wider audience; for example, Panofsky’s theory (now generally out of favor with specialists) is that the writing on the rear wall in The Arnolfini Portrait by Jan van Eyck turned the painting into the record of a marriage contract. Holbein’s The Ambassadors has been the subject of books for a general market with new theories as to its iconography; as well as being a double portrait, the painting contains a still life of several meticulously rendered objects, the meaning of which is the cause of much debate. The most notable and famous of Holbein’s symbols in the work is the distorted skull which is placed in the bottom center of the composition. The skull, rendered in anamorphic perspective , another invention of the Early Renaissance , is speculated to have been a reminder of death and mortality. Jan van Eyck, The Arnolfini Portrait, 1434: The iconography in this work has historically been the subject of debate due to its many signifiers. Some scholars have theorized that the painting was actually a marriage contract due to the writing on the wall in the background.